Natural MACROVITA cosmetics for over 30 years providing customers with joy and positive emotions of the surprising effects of their use. These cosmetics are known by the customers from Italy, England, Australia, Germany, Switzerland, Czech Republic and the USA. What makes MACROVITA cosmetics work extremely favourable and provide an ideal, natural face, body and hair care? Get to know us! Discover the MACROVITA cosmetics! MACROVITA Company is a specialist with 30 years experience in the creation of cosmetics, not only natural but also effective. Our cosmetics are repeatedly rewarded. For example MACROVITA has received certification GOOD BRAND 2015 and every year (2013-2015) we have received award in the prestigious BEST BEAUTY BUYS competition organized by the InStyle Magazine. Natural ingredients in the cosmetics reach up to 99%. Most components have an organic certificate (originating from supervised organic plantation). MACROVITA is a pioneer in the elimination of parabens and chemical preservatives. The ingredients used in the manufacturing of our products are also free of parabens. 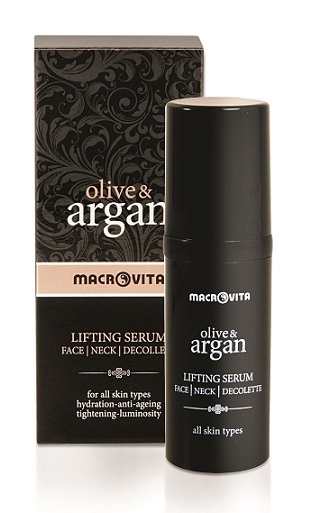 MACROVITA is the first Greek company that have used in cosmetics olive oil. Olive oil coming from Greece, is considered to this day to be the best in the world, and as a cosmetic ingredient stands out amazingly positive effect on our body, face and hair. MACROVITA cosmetics contain a wealth of over 200 natural ingredients. Plant ingredients are sourced in the most favourable, sunny climate of Greece. We find among them the plant oils from the seeds of trees in the rain forests of the Amazon in Peru and Brazil (Cupuacu), as well as ingredients from trees growing in Morocco (argan oil). MACROVITA, as a producer of several types of honey, has a big experience in getting products to apitherapy (honey, royal jelly, pollen, propolis). They are added as a rich component of cosmetics, which ensures their effectiveness. MACROVITA Company is environmentally friendly. Our cosmetics have never been tested on animals, even if the law allowed to do that. MACROVITA cosmetic not include petroleum or genetically mutated substances, are free from petrolatum and propylene glycol. Natural MACROVITA cosmetics contain at least 80% of active substance, while in the conventional cosmetic active substances which have an effect to the skin is only a few percent. Due to its natural composition MACROVITA cosmetics are extremely efficient (in product of lower quality over 90% the composition is water). Check it out by yourself how natural cosmetics MACROVITA work for you, enjoy your youth and good appearance much longer!